Hot on the heels of our recent Anki Overdrive racing game review, we're back in more familiar (and traditional) slot car territory. But wait – what's this? Scalextric have gone all wireless and app-y? Ye gads, man! It's true, and we discovered how Scalextric is staying bang up to date thanks to the Arc Air. If you've never played Scalextric you're either under six, or have spent your entire life in an Antarctic research lab. 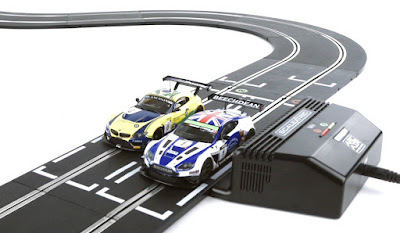 The slot car game is surely one of Britain's greatest exports, and several generations of us have spent many happy hours gripping the controllers, whizzing small plastic cars around black plastic tracks. 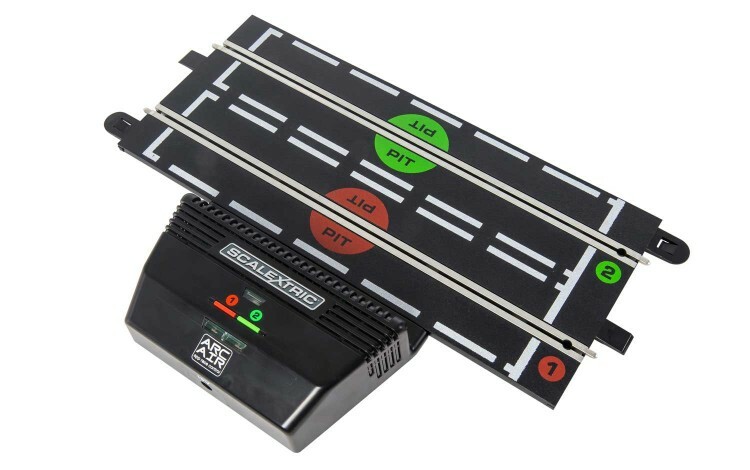 But the decidedly low-tech, high-fun game has received a 21st century update in the form of the Arc Air Powerbase; an add-on that works with existing Scalextric sets. The Arc Air first and foremost makes the traditional wired trigger controllers wireless. This means that you can stand or sit wherever the hell you like around your track, and even chase after your car as it zooms around. The Arc Air is a simple additional track part which slots in to your existing setup, coming with two new wireless controllers. What's great about this is that not only are you now free to roam around during a race, but receive feedback from the controller via vibrations. Increasing speed, taking a sharp corner, crashing... all produce a quick and responsive 'buzz' in your hand which really draws you into the game. But going wireless isn't all that the Arc Air kit does. 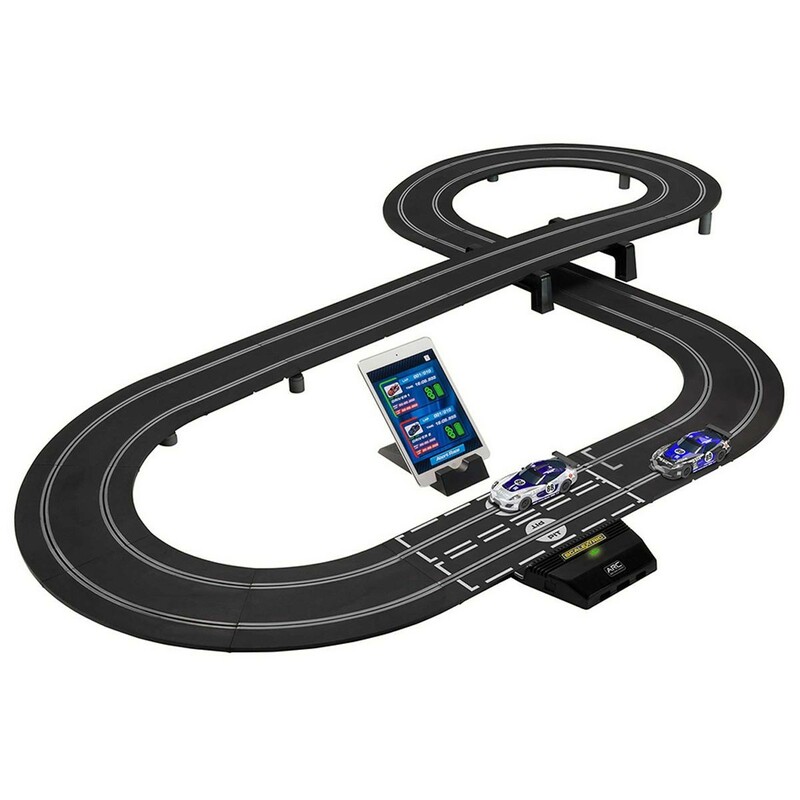 Downloading the Arc Air app to your phone or tablet (and then putting said device in the included stand – nice touch, Scalextric), the classic game becomes even more interactive. Just like the aforementioned Overdrive, and also the Real FX Racing we reviewed last year, the addition of an app adds new elements to your races. Random incidents like a tyre blow-outs and oil slicks will effect your car's performance (which is possible now that the system is 'smart'), and you can also tinker with control elements such as acceleration. Think your car speeds off a little too drastically? You can now change that. The app allows you to tailor the racing conditions and even add 'weather'. If it's pouring with virtual rain, you're gonna need a virtual tyre change – all possible when customising your car in the app. All this adds so much to the traditional game of Scalextric, with the added benefit of switching it all off and playing 'au natural' if you fancy – something the newer racing games can't allow. 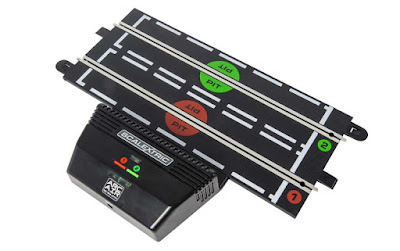 This is a great expansion set for a Scalextric set; something that many kids (and adults) may already own, slowly gathering dust at the back of a wardrobe. 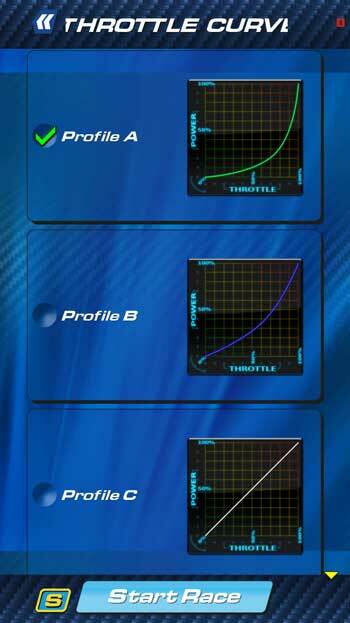 But for new players the Arc Air offers an exciting way into Scalextric, improving on what was already and exceptionally playable game.